After the stress of another move to another state within a year, plus funding for school being cut and finals, I wanted to read something light and fun. 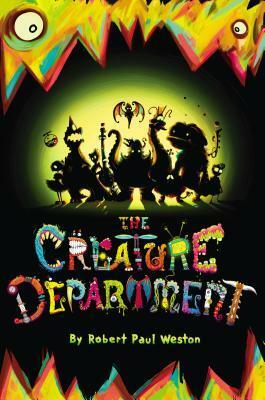 I remembered that the display for The Creature Department at the BEA was so adorable last year that I had to take the book even though it wasn’t on my list. Plus the cover glows in the dark (I am such a dork). How could it not be cute and fun? Elliot von Doppler has a cool uncle that makes wacky yet incredible inventions at DENKi-3000, and even though his uncle is head of research and development, Elliot has never been given a tour of the company. Until one day he gets a mysterious note from his uncle inviting Leslie and him over for a tour. One small problem, who’s Leslie? “Love me tender and color me Elvis!” I didn’t love this the way I had hoped. The illustrations are wonderful. Framestone is a visual effects studio that did the wonderful illustrations and probably The Creature Department website. Yet, the story wasn’t at the same level as the illustrations. Sometimes I love middle grade books and sometimes I think I’m too old for them and that’s why I don’t get them (but lets not go there). It was cute but didn’t do anything special for me. I wasn’t engrossed with the story, which is what I really wanted, and basically forced myself to finish it. This entry was posted in Middle Grade, Monsters and tagged Creature Department, DENKi-3000, Elliot, fantasy, Leslie Knope, Middle grade reader, Robert Paul Weston. Bookmark the permalink.